Rachel Thompson is the chick who writes stuff that makes you laugh. Her book A Walk In The Snark hit #1 on the Kindle Motherhood list this past September. It’s since hit about oh, SEVEN more times. #woot! She’s been nominated for Funniest Blog, Best Humor Writer & Redhead Who Makes A Killer Dirty Martini. Rachel released The Mancode: Exposed right after Thanksgiving 2011. Her 3rd book Broken Pieces can be continually near the top of Amazon’s bestselling lists. 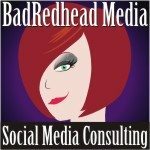 Rachel is the founder of BadRedMedia where she helps authors figure out the maze of social media. Her specialties include Social Media (Twitter is her specialty; also Facebook, LinkedIn and blogging basics), branding, marketing strategy, Amazon and author platform development. She’s a mom, a wife and a recovering pharmaceuticals rep. It’s been a long process but she’s doing okay, thanks.